Hello. Regular listeners of Speaking of History have heard several of the author podcasts from the current blogging project we are doing with the novel Guerrilla Season by Pat Hughes. 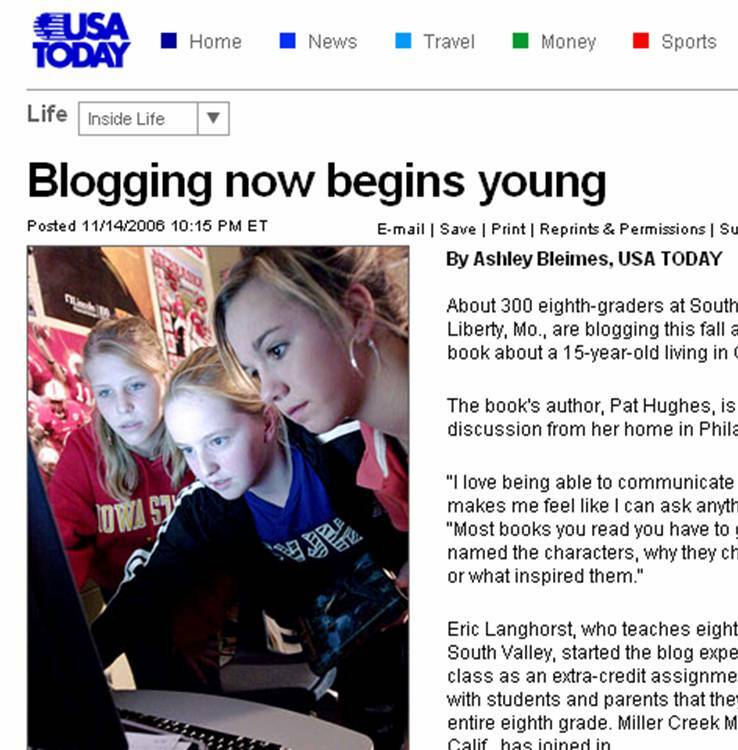 Today, Wednesday - November 15th - the USA Today newspaper published a story that mentions our project. Very cool! My students are very excited. You can check out the online version of the story here. Special thanks to reporter Ashley Bleimes for writing a great article. You can check out the Guerrilla Season Book Blog project online here. Hello. Today's podcast is the week 3 podcast from our Guerrilla Season Book Blog Project. We have over 300 students at South Valley Jr High School in Liberty, Missouri reading a historical novel by Pat Hughes about Missouri in 1863 at the start of the Civil War. The blog contains discussion questions, links, podcasts, and places to ask the author questions. Each week we have included a podcast interview with the author Pat Hughes. This week she talks about some supernatural events that took place during the writing of the book and why she decided to write a novel about Missouri during the Civil War. Hello. Tonight I want to encourage everyone to check out the Cable Leaders in Learning Awards - currently taking applications through December 15th. This past year I was very honored to a winner of a Leaders in Learning Award in the category of Pushing the Envelope with Innovative Technology. My wife and I were guests of Cable in the Classroom in Washington DC for an amazing 3 days. We met the other winners from across the country, met senators and representatives on Captiol Hill, visited with officials from the Department of Education, worked with people from the cable industry that focus on educational projects and were honored at an award gala at the Smithsonian's Museum of Natural History. One of the highlights of the week was the opportunity to meet and visit with C-Span's Brian Lamb. He discussed the various topics ranging from politics, the role of the media and education - followed by a tour of the C-Span studios. I strongly encourage you to complete an application for yourself or nominate someone for the 2007 Cable's Leaders in Learning Awards. Open to educators, administrators, community leaders, policymakers—anyone who is transforming education in or out of the classroom, Cable's Leaders in Learning Awards honor individuals whose innovative practices or policies have made a major contribution to the education of children and youth. Winners will receive $3000 and a trip to Washington, DC for the Awards Gala. Every awardee becomes a part of the Leaders in Learning community, an informative network of innovators who can stay connected and participate in an ongoing conversation about the future of education. Cable in the Classroom, the cable industry's education foundation, and cable industry partner companies, created the awards program. A panel of judges from the national education community selects the winners. You can also listen to podcasts with each of the 2006 winners produced by Doug Levin of Cable in the Classroom. The winners last year had a wide range of experiences including amazing classroom projects, a state senator that works with students to pass legislation and an administrator who got her school up and running in Louisiana just weeks after Hurricane Katrina destroyed every building in her school district. Hello. Today is the week 2 podcast for the Guerrilla Season Book Blog Project. Over 300 students at South Valley Jr High are reading "Guerrilla Season" by Pat Hughes - a historical novel describing Missouri in 1863 at the start of the Civil War. Participants are commenting and discussing the book via a blog at www.guerrillaseason.blogspot.com The blog includes links, podcast interviews with the author, questions answered by the author and discussion questions. We will be doing the project through November 19th.